Today’s been a fog and I constantly wonder if there will be a day as clear as the one out my winter window today. I know that sounds confusing, but so’s life. The sky is a crisp winter blue and unusually warm. In fact, in Indiana, I have to knock on wood as I say this or we will have an ice storm by night fall and it will be all my own fault for jinxing it. I had to tell myself that shoes caked in mud were a blessing yesterday as the kids came in from playing out in the backyard, a muddy mess. The moles even are confused and have made a bumpy and mountainous wreck of our front yard. Muddy shoes were going to happen, but the kids playing outside with barely more than a zipped coat was so refreshing. But still, I’m as foggy as a school-delayed-morning, and wondering if this is really the answer. I learned my neurologist is suddenly out of network now, so’s the guy he sent me to, and the new meds may work, but it’s gonna be a long battle of getting my body to believe it. I just wanna flip back the clock and go back to when all this medical stuff was not at play, and I was a more carefree gal. I swear it existed once. Sometimes you just have to decide to let it all go. Be that person anyway. I can tell you that when this picture was taken, there wasnt a slight chance that I felt like it looks. I wasn’t feeling particularly silly, or carefree… but my son was. I was pre-migraine and slipping quickly back into the fog of medicine as it battled to bring me back before it hit for the second time that day. Drake was high on life, happy, and being a bit over-the-top hyper. I was borderlined. I could go all, “quiet down or else” OR I could roll with it. I decided to ride on his shirt tails and handed the camera to my daughter and let her capture HIS moment with his mom. Suddenly it wasnt even about me… not really. 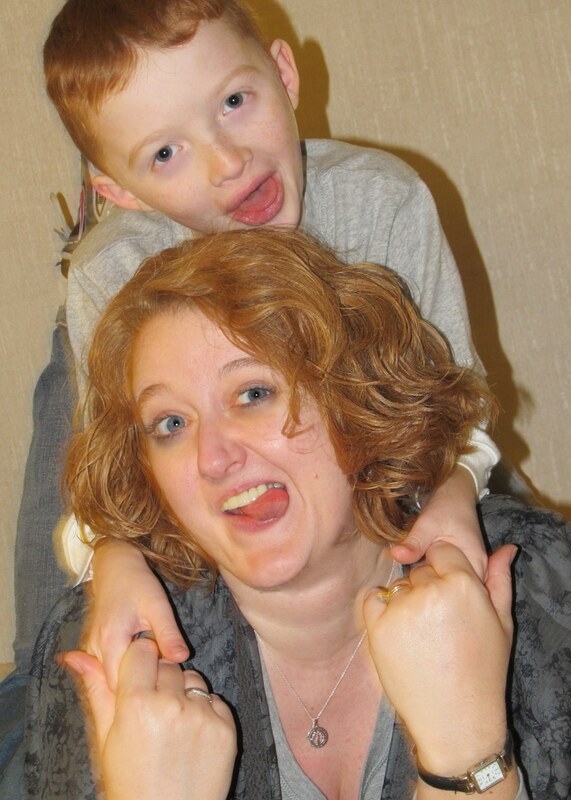 I want him to remember me as a silly mom, not a medicated mom. I want it to matter more WHO I was in the good moments, when i just let it go. It’s my prayer that the other moments, out of necessity over this past year, will fade from the kid’s minds and they will remember that I tried. I really did. My life lesson? Circumstances are what they are. How you choose to respond to them is what counts. You can either be ruled by them, or you can chose to rule them. There honestly IS a choice. Sounds a whole heck of a lot easier than it is. I get that… but life isn’t easy, and no one ever promised it would be. Let it go, just when you think you cant. Let a moment of silliness you don’t see coming have it’s way, and roll with it. Even when you don’t feel like it. In the end, it will bless you long after it’s over. It will take your next foggy day and be like a beacon of light; shinning and lighting the way to the next blue sky.